(Re)discover the blasting peat smoke of Big Peat in this Christmas Edition 2017! The Big Peat Christmas Edition 2017 is an assembly of 7 Single Malts from Islay. This is the seventh edition of this Blended Malt. 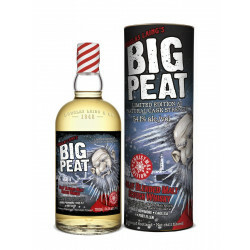 With delicated slightly smoked peat, iodized and salin, this whisky is a perfect blend from Islay Island. We can find the rare Ellen Port in its composition. Delicated slightly smoked peat, iodized and salin.